Welcome to Love Your Association. Whether you’re established or just starting up an association, we’d love to talk to you and discuss ways in which we can help. We recognise the work you do in and around the beach hut community, running beach patrols and we will work with you, to protect your members and add value to your member benefits. Click here to see where Love Your Hut has visited this year and what we have to report. Event sponsorship, including for fun days, charitable events. Financial rewards for business introducers – sign up with Love Your Hut and your association will receive a contribution for every member that insures with us. It was great to attend the Brightlingsea Beach Hut Association’s Annual General Meeting last night (Wednesday 24th June). As usual, the welcome was warm and turnout seemed as good as ever. It was nice meeting the hutters, both old and new, and I’ve no hesitation in saying they’re an enthusiastic bunch! Pleased to say I was able to help with a couple of queries too, which goes to prove that there’s no substitute for getting out and about in the beach hut community – something in which Love Your Hut takes pride. 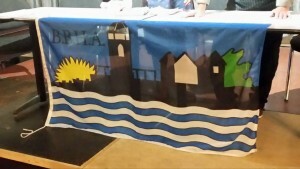 Good to see the Brightlingsea Association’s colourful new flag, bunting and pennants – what a great idea! Maybe some other associations might want to consider it? So overall then, a great meeting: there was plenty to talk about and I can report that the free drink went down very well! Hopefully we’ll be attending again next year. To contact the association in Brightlingsea, please email their secretary Sarah Chandler at [email protected]. We encourage associations to use our site to share useful and topical information so if you have any news you want to share, please let us know and we’ll happily pass it on! To spread the word, contact us.